This article is part of Morningstar's "Perspectives" series, written by third-party contributors. Here, J.P. Morgan’s Chaoping Zhu comments on China’s concerning GDP and demographic data. Today’s China GDP growth rate of 6.6% reflected a weakening in momentum, although some data suggests marginal improvements in industrial production and investment. Besides data for economic activities, investors should note the record lows in population growth and the birth rate, which will put pressure on the long-term economic potential of China. For full year 2018, GDP growth reached 6.6% year on year, slightly above the target of 6.5% set at the beginning of the year. However, the gradual decline in GDP growth over the four quarters suggests growth remains under pressure. 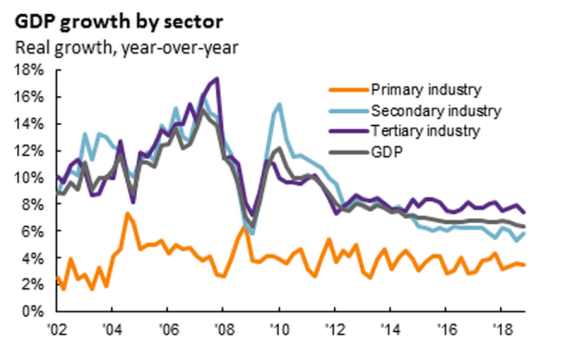 Among the three major sectors, improvement could be seen in the secondary industry, which reported a higher growth of 6.4% year on year in the fourth quarter of 2018 than that of 5.3% year on year in the third quarter. This change is in line with the rebounding growth in industrial production. This might be a result of the easing control on upstream and polluting sectors, as evidenced in the subsector production data. Electricity generation grew by 6.8% year on year in the whole year and 6.2% year on year in December 2018, which were in line with the GDP data. This could help address questions on the validity of the official growth data to some extent. Detailed data series are showing some signs for marginal improvement. The industrial value-added grew by 5.7% year on year in December 2018, 0.3 percentage points higher than in November. In the subsectors, quicker monthly growth was seen in rubber and plastic products, ferrous metals, and non-ferrous metals, which were weighed down by rigid environmental protection rules. Meanwhile, the production of machinery specialised for industrial purposes also accelerated, suggesting warming expectation for a pick-up in investment. On the other hand, there was significant reverse in the trend in the auto sector, which was a major growth drag in December. Due to the high household debts and an end in the replacement cycle, auto demand may continue to weaken. This will probably prompt the government to cut the purchase tax for small-engine cars to support demand in 2019. The growth rate of infrastructure investment stabilised at 3.7% year on year in the single month of December 2018, compared with the negative growth rates in the three months to the end of September 2018. As local governments received more funding supports in the second half of 2018, infrastructure investment could be the major growth stabiliser in the short term. The economic activity data seems to be in line with expectation of domestic investors, with big concerns raised by the deteriorating population data. The birth rate collapsed to 10.94 per thousand, a record low since 1952, even though Chinese governments started to encourage couples to have a second child. Even though a lower death rate was reported at the same time, the natural growth rate still hit a new low of 3.81% year on year since 1961. Domestic investors are very concerned about the diminishing demographic dividend and the pressure on the social security system, although these factors may not have instant impacts on asset prices. Looking forward, we expect to see the government continue escalating its stimulus policies till further consolidation of the growth data. How Did the Stock Market React? The A-share market responded to today’s data release by about 0.5% increase in major indices, probably suggesting investors are expecting further monetary easing and fiscal stimulus. We expect to see a combination of easing measures to be announced in the first three months of 2019, including 200-300bps RRR cuts, a 2 percentage point cut to VAT rate, and supportive policies for auto and home appliance. Among these measures, the VAT cuts are expected as the most important measure to revitalise investor confidence. Meanwhile, the possible relief in US-China trade tension could also have big impact. What Will Trigger an Emerging Market Rally in 2019? J.P. Morgan Asset Management is the investment arm of JPMorgan Chase & Co. and it is one of the largest active asset managers in the world.